Once you understand your general face shape which include: oval, round, square, triangular or pear, heart and oblong. The next step is to examine any personal quirks you may have that are unique to your face and discover the things about your face that make you shine. The key is to accentuate the positive and minimize the negative. Prominent Nose: When dealing with a prominent nose, you can minimize the severity of the profile by choosing a style that includes fringes and bangs if possible, and pulls the hair back from the sides of the head. Avoid massive curls. Keep the hair clean and simple. Shorter, blunt-cut styles work the best. Heart Shape: If this is your face shape, you’ll want a hairstyle that accentuates the jawline and narrows at the eyes. Heart-shape faces need a softer, curly style. Prominent Chin: This challenge is similar to the prominent nose scenario in that there is a sharp angle to the profile of the head. The solution is also similar. Use fringes and bangs if possible and keep the style at least neck or shoulder length. Layer the ends of the hair and create curves as opposed to curls. Flat Features: If you have a facial feature that appears too flat, choose a style that pulls hair back and off the face. Add volume along the top and back to lend depth to the profile. 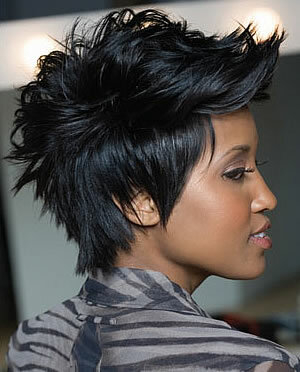 A short layered graduated cut styled with extra volume can also do the trick. When working with a low forehead, it’s best to style the hair away from the face – either backward or to the sides – to create a more flattering look. This updated shag is sophisticated enough to wear to the office with a sleek suit yet sassy enough to rock with a funky beaded dress to the club. An important element to maintain in achieving a style like this one is a precision cut. Be sure to add a moisturizing yet light pomade to ensure your style lasts throughout the night. From Your Desk to the Dance Floor: Research indicates that we begin to form an impression of an individual’s personality and character within seconds of first meeting them. While a multitude of factors ranging from makeup to clothing choices contributes to the impressions we create, hairstyle has been shown to be of the most prominent factors in impression making, so knowing your face shape will help you pick the right haircut for you! Oval Face: An oval face is considered to be the ideal face shape and is most versatile. Nearly every hairstyle looks good on this face shape. People with an oval face can wear most haircuts, styles and lengths and it looks “right” every time. Round Face: If you have a round face shape, the goal here is to slim down the face. The hair should be cut and styled to create an illusion of length in the face. Hair below the chin line should be worn with a face lengthening center part. Creating height on top of the head and minimizing the hair width by keeping it flat at the sides and around the ears can also achieve a sliming effect. Square Face: Your hairstyle should try to soften the sharp angle of our jawline and minimize a squared-off forehead look. The ideal style of haircut for this face is one that creates width at the sides. A fringe can shorten the face, and a a style with a side part will help to reduce the square appearance. Your hair should be layered around the face to soften the jawline. The bob oozes sophistication and is perfect for a fancy formal dinner party. The many variations of this cut allows you to customize it to suit your face shape. We suggest getting a bob that is layered for added body and dimension. Request a whimsical side-sweep bang for sheer feminine perfection. You can make a great first impression with amazing hair. Before choosing that do you saw on your favorite celebrity, or making that severe transformation by weaving or wigging it, take a good look at your face shape, and select a haircut and style that works best for your facial shape and features. Triangular or Pear shape: When choosing a hairstyle for this face shape, you should search for a haircut and style that narrows the chin and widens the forehead to balance the faces’s proportions. The objective is to give the illusion of an oval face creating width at the forehead and temples. Oblong Shape: For this face shape you should add width and fullness to the sides of the face, as well as around the eyes, cheekbones and ears. High or Low Forehead: When dealing with a high forehead, try bangs styled forward onto the face in the style of your choice to minimize the amount of visible forehead. Remember to emphasize your good features. As long as you’re bringing attention to the things you feel are the most flattering about you, onlookers will hardly notice the unflattering ones.